The new Range Rover Evoque will include a 3-cylinder Plug-in Hybrid (PHEV) model as well as a 48-volt mild-hybrid (MHEV) – in addition to three- and four-cylinder Ingenium petrol and diesel engines. The new Range Rover Evoque has been developed for electrification, with a 48-volt mild-hybrid available at launch and a plug-in hybrid model offered around 12 months later. The mild hybrid powertrain is a first for Land Rover and works by harvesting energy normally lost during deceleration thanks to the engine-mounted belt-integrated starter generator, storing it in the underfloor battery. At speeds below 11mph, the engine shuts off while the driver applies the brakes. When pulling away, the stored energy is redeployed to assist the engine under acceleration and reduce fuel consumption. Available across the range of four-cylinder Ingenium petrol and diesel engines (when specified with automatic gearbox), the mild hybrid delivers CO2 emissions from as low as 149g/km and fuel economy from 50.4mpg (based on the new NEDC Equivalent WLTP test procedure). If the customer chooses the 150PS diesel engine with front-wheel drive, the Evoque only emits 143g/km. An even more efficient plug-in hybrid electric vehicle (PHEV) model and three-cylinder petrol Ingenium engine will also join the range next year. 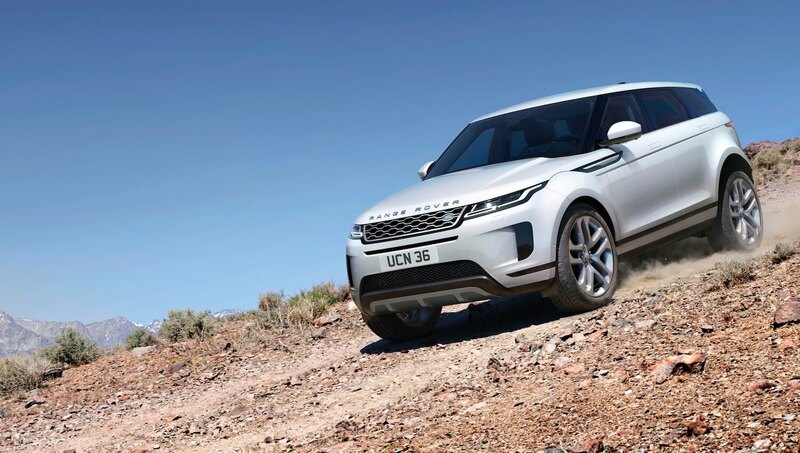 The new Evoque features All-Wheel Drive, as well as a second-generation Active Driveline with Driveline Disconnect to enhance efficiency and Adaptive Dynamics. Terrain Response 2 – technology first found on the full-size Range Rover – automatically detects the surface being driven on and adjusts the set-up accordingly, while the Evoque can now wade through water up to 600mm (previously 500mm). The new Range Rover Evoque is the first vehicle in the world to feature Ground View technology, which effectively makes the bonnet invisible by projecting camera imagery onto the upper touchscreen to show the driver a 180-degree view under the front of the vehicle. If rear visibility is compromised by passengers or bulky items, a camera feed from the top of the car displays the view behind the vehicle in high definition. The screen provides a wider (50-degree) field of vision and superior visibility in low light. The new Range Rover Evoque is available to order now, priced from £31,600 in the UK for the 150PS diesel manual front-wheel drive model.